This is a yoga posture that requires a flexible back and shoulders. It also requires upper body strength. 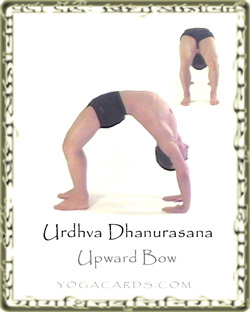 Lying on your back bend the knees and take the feet in towards the body. Place the hands beside the head with the fingers pointed back towards the body. Raise the body up so that all that remains on the mat is the hands and the feet. Move the chest forward if your shoulders are flexible. This will align the upper body and arms into the perfect bow shape. This yoga posture strengthens the arms, shoulders legs and stretches the lower back. The hamstrings are strengthened (the biceps femoris, semitendinosus and the semimembranosus). The gluteal muscles are all strengthened (gluteus maximus, medius and minimus). The feet have a tendency to turn out a little. The form does not look quite as good when this is done but sometimes its a necessity because of a knee imbalance that can be caused by forces on the knee joint. Letting the feet turn out slightly may be more balanced on the knees but for good form try to keep the feet pointing straight. Weight will naturally fall onto the outside of the feet and hands. Push down on the inside of the big toes and the inside of the hands then try to lengthen the inner arms and legs. Many practitioners cannot perform this pose. Some do not have the shoulder flexibility some do not have the back flexibility or some have injured backs. Offer a posture that is easy to get into and has similar benefits to keep the flow of the class.